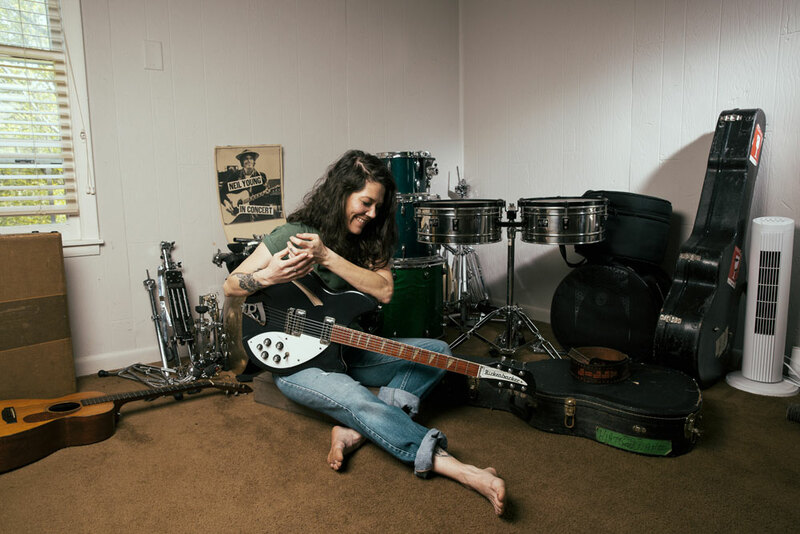 Lilly Hiatt is a Nashville-based singer-songwriter that sometimes crafts heartworn acoustic tales from the long threads of country and roots music, and at others, tears the threads out entirely to revel in amped-up, ragged rock 'n' roll. 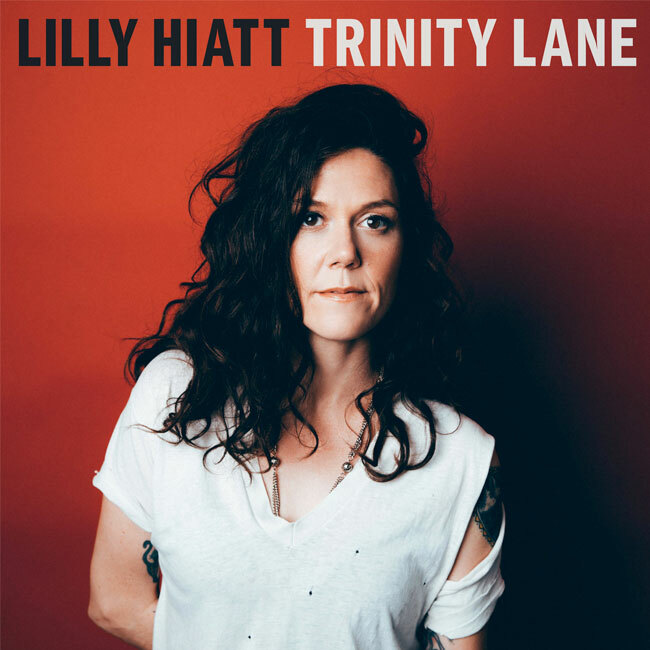 In 2017, Hiatt released Trinity Lane, a collection of songs written in her house on a quiet, East Nashville street, that were then taken to the studio and given arrangements in the vein of Liz Phair and other '90s alt-rock artists. Addressing heartbreak, hard-fought sobriety, and sometimes painful self-discovery, the gnarled, distorted guitars on the album help exorcise Hiatt's demons. Having just wrapped up a European tour and a run of U.S. shows with Justin Townes Earle, Hiatt will continue to be on the road through the summer and fall. For tour dates and more information about her music, check out her website here. Lilly Hiatt - "The Night David Bowie Died"
I've heard you talk about the writing of Trinity Lane, and how they all started on acoustic before heading into the studio, but has playing these songs in front of audiences changed them in any way for you? I think that the essence of where they ended up is definitely still there. We definitely play some things a little faster now, like we're a little punkier, or we extend the ending to jam it out for a little bit. You know, all sorts of things sort of naturally begin to happen when you're playing live. And you kind of get like a better grip on the songs—it's funny to me, whenever I make a record I know the songs but they're still pretty new to me, so the record versions of the songs are like in their infant stages, even though they're fleshed out. I've only played them for maybe a few months by then, and I haven't played many of them live. Now it's like oh, we've played these songs live for like eight months—honestly, we're better at them, playing them now. So it gives us a little liberty to change a little something up if you want, but I'm certainly not one to like reinvent the song over and over. I have a way I like to play it, and maybe the tempo changes or maybe I'm on acoustic, or maybe I'm on electric, but they kind of stick to a feel. Have any of the songs from Royal Blue (from 2015) or Let Down (from 2012) gotten a little more rocked out while playing with this band? For sure. They really have. It's really fun like playing your old songs with different bands, because this band I've played with for a little over a year and a half now, which is cool and I love them—playing with them so much—and they definitely put their touch on some of my older stuff. Again, it's not completely different but it's gotten a little bolder in a way. Who all is in your band now? Right now I have on guitar, a guy named John Condit. On bass is Robert Hudson. And then for drums I've had a few different people in my crew, so I don't know if you want the same of the guy that's been touring with us, or the guy that made the record with us who's not in my band anymore but he's still a friend. I know it was Allen Jones on the record. Who's the new drummer? We've been playing with this guy, Matt Scibilia lately, and he's very cool and very solid. Can we talk about the recording of Trinity Lane? How did you meet producer Michael Trent, and what was the setup like at Studio Bees [Trent's home studio]? I actually met him like four or five years ago on the Cayamo music cruise really briefly, because I knew Cary Ann [Hearst, a solo artist, wife to Trent, and his musical partner in their duo Shovels & Rope]. We had some mutual friends because his wife was from Nashville—she's like a raised-in-Nashville girl and so am I, so I was excited to say hey to her, and then I met him and he was really sweet. But then, like I didn't really keep in touch or anything until Kim at New West had suggested to me to hit him for producing, and I thought it was a really cool idea. We just started talking on the phone, and then we met up a couple times and kind of got a plan down. I just knew kind of pretty quickly, I really like this guy, he's really mellow, but he's like a good listener. 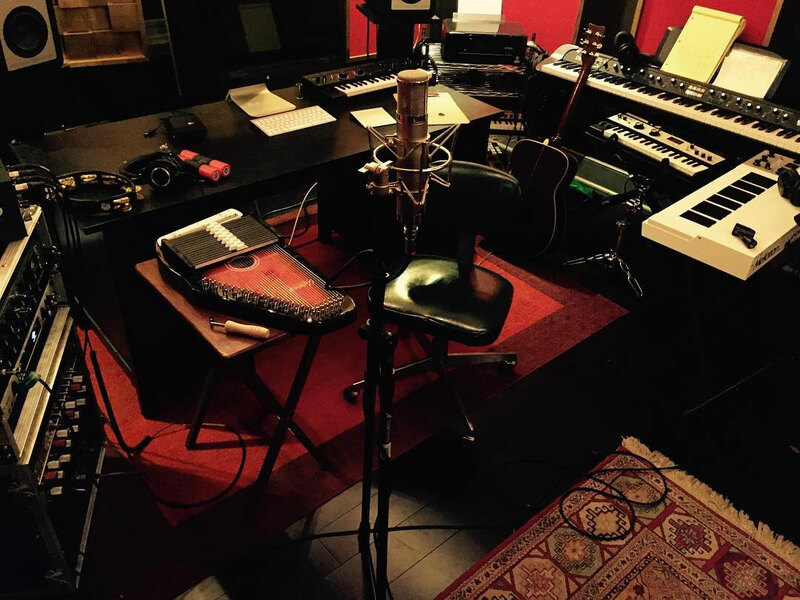 His setup at Studio Bees, I thought, was so cool because they actually just finished his studio—which I hope I get to go back and work in at their house—but when I was there they were still constructing there. He had a studio in the upstairs of his house. Pretty simple setup, but what he had was like nice stuff. I wish that I could give you more specifics but I don't know a ton about what the compressors were and stuff like that, but it was a digital setup. He had some amps, some guitars, and he had a little piano that he's had forever. I'm trying to think what else he had that was really cool—the Mellotron makes a little appearance on a lot of these songs, subtly. The cool thing is you don't really notice because it's just doing little things like the strings on "Sucker" is the Mellotron, stuff like that. The organ on the song "Records" is the Mellotron. How'd you go about fleshing out the songs—were the arrangements done at the studio or had you and the band kind of come up with how you were going to play them before getting there? Well, the way that I usually do it before I record it is I get together with my band and we rehearse for three or four days—not over-rehearse, but get a grip around each song and a direction. I'd like to say we probably did the song from about 75 percent there. And then, we took them to Michael, in terms of structure, because I kind of—I try to write, I try to flesh out my songs with the writing initially and make sure they're complete before I take them to my band. So, yeah, we get a grip on them, and then we went to Johns Island [where Studio Bees is located]. We would play each song like three or four songs as a band and Michael would just watch and listen and literally not say anything and let us talk about it and watch us work it out, and then he would jump in and make suggestions. And his suggestions were really amazing, because a lot of them didn't alter the integrity of the song, but there's one where maybe at a time he said why don't you go C chord instead of A minor for that part of the chorus—stuff like that just really refined what we had and then pepped it up. "Trinity Lane," that was a song that he was like let's punk rock this out harder. We had kind of been thinking that but we didn't know how to get there, so he's the one that kind of liberated us to just go for it. 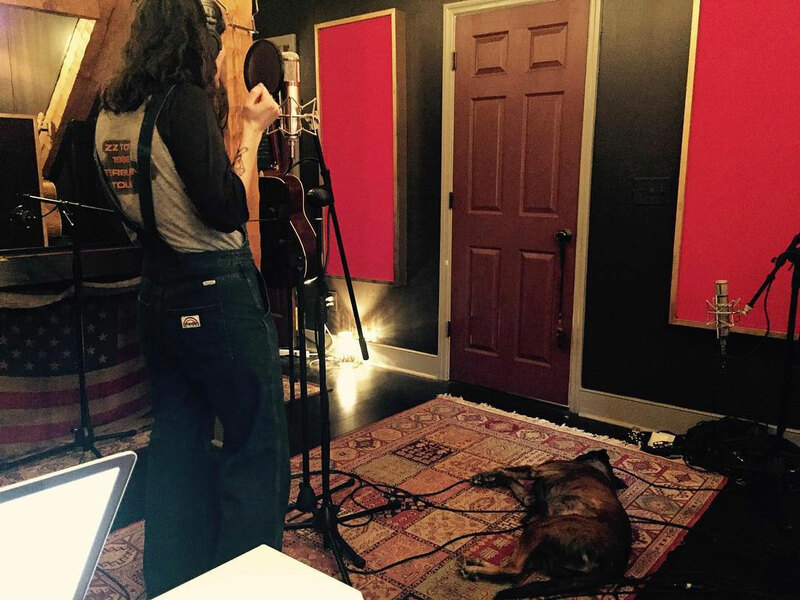 Lilly Hiatt - "Trinity Lane"
How was like recording the guitars on there? I've seen the pictures of you with the Rickenbacker—was that what you were playing on the album? The recording of the guitars was really fun. Let's see, the Rick is a 360—that's what I tracked with,—and it was cool because my guitar player, John, is the one that totally got me into the Rickenbacker. He brought his for me to borrow and then I got the same guitar because I was like, I have to have this guitar. It's perfect for me, but for a while I borrowed his and it was like a natural fit. I tracked with it, but the Rick is pretty hard to keep in tune for recording. I mean, I love playing it live. I keep mine in tune pretty well, but like it's just one of those, so we used it on a few tracks, but I also used quite a few others. I used the engineer, Andy's, Gibson. It was like a J-200, and so I used that for a lot because it sounded nice when it recorded. I noticed there's maybe some distortion or just like a little bit of overdrive on the vocals on some of the songs—how did you go about tracking the vocals? For the vocals the band went home and I just stayed with Michael and Andy, the engineer, Andy Dixon, and just sat in the room and sang and they recorded it, and Michael's dog was at my feet most of that time. It was pretty fun. So, there was no like isolated vocal booth or whatever. And in terms of the distortion and stuff, I think that there were just different treatments they used. We would talk about each song, kind of, like "Trinity Lane," we tried, I think, a little dryer treatment but then we decided against that. And then, "David Bowie" ["The Night David Bowie Died"] is certainly distorted. At first, I was kind of like is this too distorted, but then we were like no, it's not, it's the vibe of the song. That was the fun thing about recording on Pro Tools and getting to use those little treatments. I've recorded both ways, analog and digital—it's all cool—but it's fascinating to see what the click of a button can do. There's not auto-tuning or anything going on. I'm a purist in that way, but it's fun to throw a little distortion on your vocal. On the title track, on "Trinity Lane," you've got that line about your work ethic, "sleeping well, working a little harder, putting your faith on something you can't see." Have you been able to keep that going—do you have like a whole new batch of songs now? I definitely have quite a few new songs, I have about a billion iPhone recording ideas that are half-finished. But work ethic, I think it goes into a lot of areas. Touring is hard work. I tour manage my band, which is a lot for me, so it's been a very busy year, which has been amazing, but there's only been little clumps of time to kind of create. So, that's something I've had to learn to carve out amidst all the other stuff, which is great stuff, but to write, I need space to pull back a little. I really haven't gotten to do that, it's kind of a luxury to do that, so I've had to learn how to make it for myself. But I am writing, and I have goals with kind of getting back in the studio, you know, not to rush myself, because I like to have really good songs before I go in the studio. But I like to give myself deadlines, like By the end of this year, you should have a lot of great songs, you've done a lot, you should have plenty to write about. So, getting there. I saw that you were at Willie Nelson's ranch for a show a little while ago. What are some of the highlights from this almost year of touring? Oh my gosh, well, that was a highlight—that was a wonderful day for us. Just seeing Willie play was amazing. That was enough to make it amazing, but the whole day was really cool. Luck [the Texas town where Willie's ranch is located] just throws a great party—they're awesome. And, the Drive-By Truckers tour was amazing. The whole tour was amazing, but if I had to highlight a night, we played two nights in San Francisco, and it was just sold out and wonderful and cloud nine for us. We've just had so much fun. Honestly, I was thinking about the tours we've done—we've gone to West Coast twice in the last six months—and it's awesome, all of it. When you do go back in the studio, do you think you'll be going back to Studio Bees? That's a really good question. I definitely think that I will be back at Studio Bees if I'm permitted. [Laughs.] I don't think I did anything that would exile me from there. If I'm invited back, at some point I certainly hope to go back there. And Michael is wonderful, just to sing his praises a little. It's not like Trinity Lane was his signature sound that he's done on all the records he's made, he made that for us—with us. I think he adapts to what you want and accentuates that and puts his touch. He brings that out in whoever he's working with, and I think that's a real gift.